I haven’t been adventurous at all with this year’s reading challenges. I do need to do the TBR challenge if I don’t want to be entirely overrun by books and the Vintage Mystery Challenge isn’t so much a challenge as a way to discover new authors in my favorite genre. Next time I should choose a challenge that really is a challenge, perhaps? I don’t know. Reading is such a pleasure and relaxation for me, I hesitate to turn it into a true “challenge.” I have enough of those in my life. Perhaps instead of more challenging challenges, I might participate in the various read-alongs I hear about that don’t last a whole year? But enough about why my challenges aren’t really challenges—let’s talk about books. The first book I read this year was from my TBR pile: The Greenhouse by Audur Ava Olafsdottir, originally written in Icelandic and translated by Brian FitzGibbon. 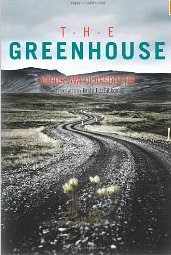 The Greenhouse follows Arnljotur, known as Lobbi, a young man from Iceland, who leaves his home, father and autistic twin brother, to restore an old garden in a remote village monastery in an unnamed country in Europe. Lobbi’s mother, with whom he shared a love of gardening, has recently died in a car accident. On top of that, during one impulsive night, Lobbi has fathered a child with Anna, an acquaintance. Anna is raising their baby daughter, Flora Sol, without much input from Lobbi, who doesn’t really know what his role with Anna and Flora Sol should be—though he’s more clueless than unwilling. After he begins work on the monastery garden, Anna and Flora Sol come to visit. Anna wants to continue her studies and needs Lobbi’s help to care for the baby. During their time together, Anna and Lobbi begin to build a relationship, and Lobbi slowly learns how to nurture the people in his life as tenderly as he nurtures the flowers in the garden. I loved this book. It was a quiet and gentle story, with interesting secondary characters, such as Lobbi's father and the film-buff monk Father Thomas. It was a page-turner in the respect that I enjoyed that world so much I could hardly wait to get back to it. 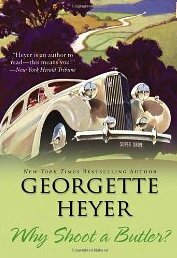 My first Vintage Mystery read was Georgette Heyer’s Why Shoot a Butler? In a twist on a murder mystery cliche, a butler is the first victim. Amateur sleuth Frank Amberley must help the baffled police find the murderer before they arrest the young woman Frank is falling in love with. Reading this type of cozy mystery feels like slipping under a fuzzy blanket with a good cup of tea (I always crave Earl Grey tea when reading books or watching movies set in England). I love Georgette Heyer’s historical novels, which she’s better know for, but the few mysteries she wrote also contain her trademark wit and humor. I plan to read at least one more of her books before the challenge is done. I love the covers of these editions as well—wonderful vintage artwork. Tags: Audur Ava Olafsdottir, Books, Georgette Heyer, Reading, Reading challenges, The Greenhouse, Why Shoot a Butler? Have never read any Icelandic writers' works before but The Greenhouse sounds very interesting. Will be keeping a lookout for that now. That first book sounds like a good one. I just read one my sister recommended for called The Glass Castle. It's a true story and all I can say is you won't believe kids could grow up this way in the sixties and seventies but they did. It was a Page Turner to see just what they dealt with next. It's not too long - might be a good read for an airplane ride as you might just finish it before you land. Hope you have a really good time. My reading challenges are more like un-challenges too - I pretty much know I can complete them and don't make them too hard. But I do that on purpose, too, since, like you, I love to read and don't want it to become work. The Greenhouse sounds like a great book - I've added it to my wish list at PBS. I just finished a book I couldn't put down too - Gone Girl by Gillian Flynn. VERY different from The Greenhouse, but a really great book. Hope you have a great time in Texas - sounds like fun! I hope that you had a great visit! These books look really good. Michelle--Glad to hear your reading is off to a good start, too. I loved The Greenhouse, and would like to read more works in translation. I had a great time visiting my friends, but had little time for reading except on the airplane! Thanks, Timaree--I did have a great time. I guess there are all sorts of page turners! Thanks, Kathy. They were really good. I'v been quite happy with my choices this year. Cheryl--Thanks, I had a great time! I want to read Gone Girl, too, and have it on my library list.